Welcome to our guide showcasing the most popular types of patios including pros & cons and design ideas. 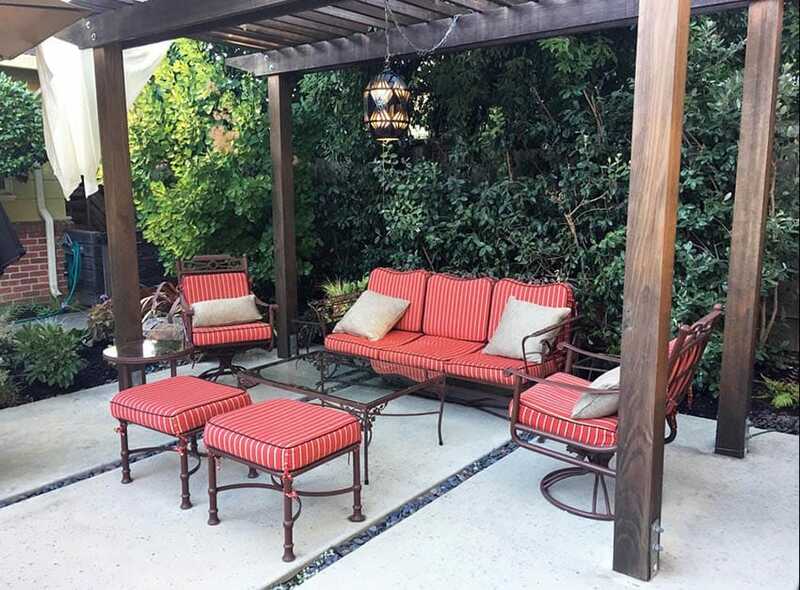 A patio can be a beautiful addition to any backyard and it can even be a great place to relax with friends and family. 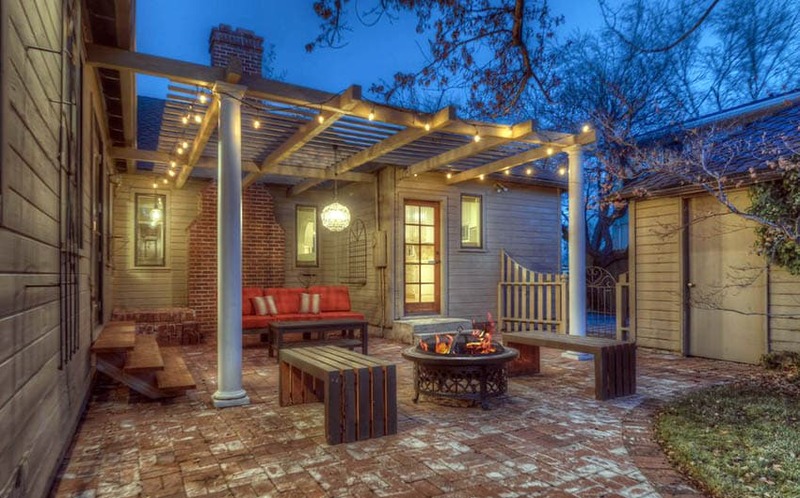 Your house is unique, and – like your house, your patio should reflect your own personal style. Luckily, you have plenty of choices when it comes to patio design. Before you make your choice, let’s take a close look at what some of your options are. Paver patios are a rather low maintenance option when it comes to patio material. However, it does come at a higher cost. Typically, you’ll be paying around $12 to $22 per square foot. You can bring the cost down to around $2 to $8 per square foot. 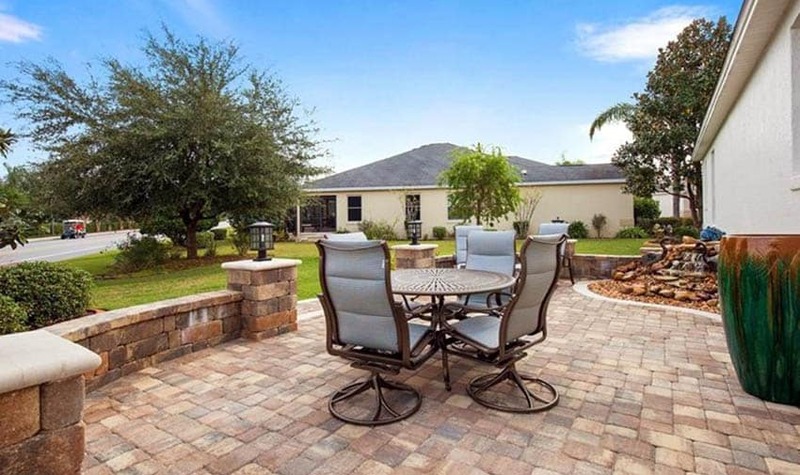 It should be noted that the installation of paver patios is much longer than other options. Many estimates put the installation time of 3 to 5 days for a professional team to install a paver patio. A big part of this is the fact that paver patios take a lot of prep work before the material itself is laid down. The first step is to remove any dirt or grass down to the subsoil level. In some places, this is as deep as a foot and a half. Then, gravel must be added and then leveled. After that, about an inch bedding sand needs to be installed and after that you can install the pavers themselves. Once the pavers are set out, PVC or metal edging needs to be used with edge spikes to be used at a measurement of at least every foot. Once the pavers are set, you’ll want to use a broom to brush sand into the gaps between them. You’ll then want to vibrate these into place. Finally, the patio will need to be cleaned and sealed. You can make your patio last even longer if you use a seal for patios that is weatherproof. Patios with paver material are usually made of stones made out of concrete, clay brick, or even natural stone. These are most often installed as concrete in the form of small but various sized pieces with different colors, patterns, and textures. We will take a deeper look at other types of concrete patios that you have to choose from later. Unlike other concrete options, paver patios don’t need time to set and if you walk across them immediately you won’t cause any damage. Another con of paver patios is that weeds tend to grow through them. Some people try to avoid this by using polymer sand to prevent this problem. It’s possible to redo a paver patio if it is run over with weeds in the case that things get out of hands, though. To end on a positive note, a great benefit of paver patios is that they aren’t as prone to weather-related problems. They won’t contract and crack as easily as other options during cold snaps and winter months. 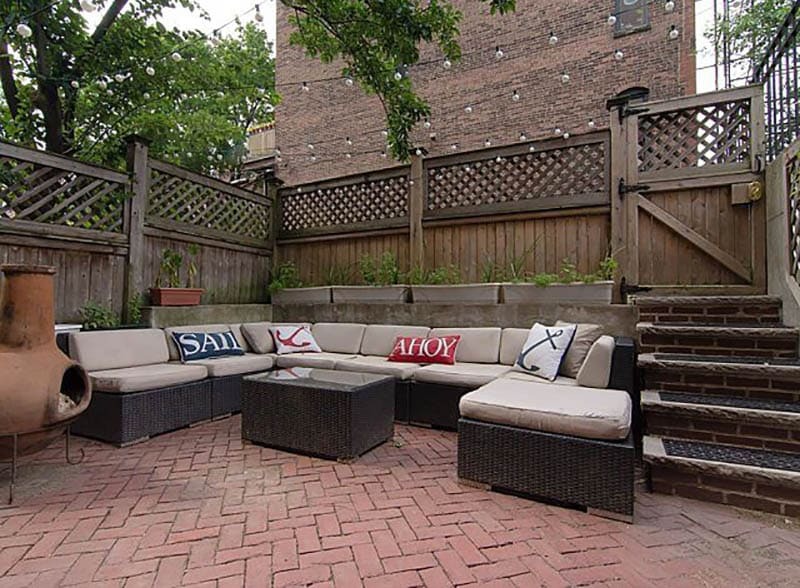 Brick patios are a classic option for patios and have a rather widespread appeal. The traditional choice is red brick but there are many other color options as well such as brown, black, tan, cream, gray, buff, and even pink. 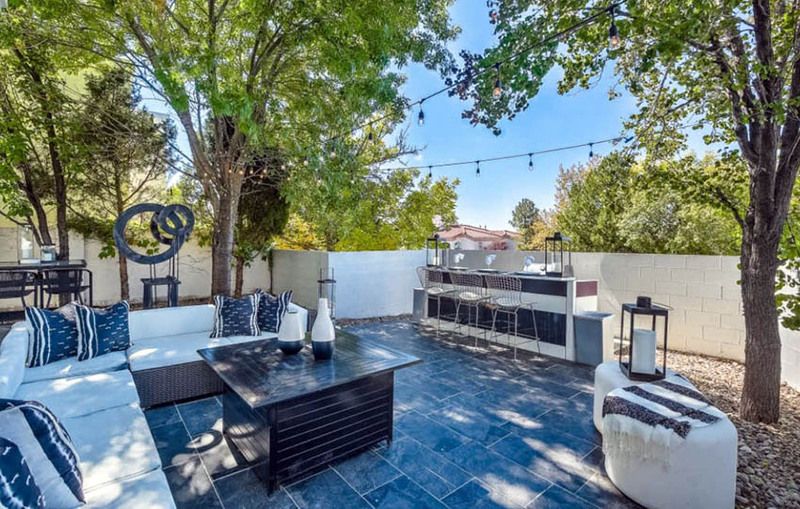 The bricks used for patios aren’t the same “builder” bricks you might see in walls, though. These bricks are thinner but still durable enough to handle people frequently working across your patio. If you want to install these bricks yourself, you’ll be paying $3 to $5 per square foot. On the other hand, for a professional installation, you’ll pay around $12 to $18 per square foot. However, you’ll want to keep in mind if you are installing these bricks yourself, you’ll probably need a brick saw. If you don’t own one of these they will cost around $60 to $95 to rent one. An aspect of cost to pay attention to is whether to set the bricks in sand or mortar. Setting them in sand is cheaper but the bricks are likely to shift. While mortar settings are more expensive, you won’t have to worry about the bricks becoming uneven. The downside to brick patios are they don’t react well to cold climates like a paver patio. This means that you might have trouble with bricks cracking after a while. You might also experience issues such as weeds and grass growing through – particularly when dealing with sand-set brick. Fortunately, brick is rather easy to maintain. All you have to do is to occasionally power wash or use hydrogen peroxide or vinegar to keep your brick patio looking like new. See more brick patio ideas here. Flagstones are installed in the form of thick slabs of stone, usually around 1 to 3 inches. Unlike the paver or brick patios we’ve looked at so far, these don’t use regular, repeated designs. Instead, flagstones come in irregular shapes that will give your patio a one-of-a-kind appearance. On average, a professional installation of a flagstone patio costs around $12 to $28 per square foot. Most homeowners choose to have a professional install their patio when they use flagstone because unlike an option like brick, it’s harder to place pieces together. A professional can have the job done quickly and you won’t need to worry about uneven spacing. If you’re pretty handy and want to do the installation yourself, the material alone will probably cost around $3 to $10 per square foot. When you are choosing flagstone, there are plenty of options. 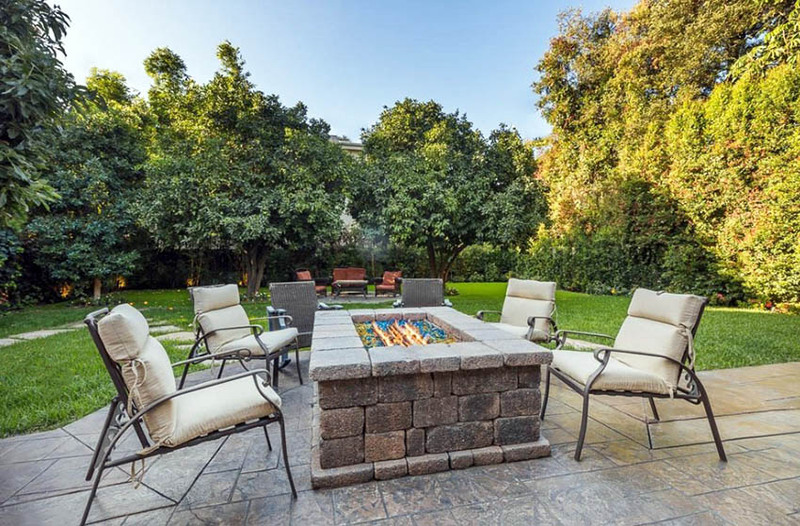 While you can definitely find almost all of these options online, if you choose something local, it’s far more likely to fit in seamlessly with the environment of your yard. Another distinction when it comes to flagstones whether to use flat stones or uneven ones. While uneven flagstones have a natural charm, there are some drawbacks. Mainly, it can be hard for some to navigate uneven terrain. In the case that you are worried about items such as wheelchairs or walkers or even someone just tripping, you might want to consider a flat option. One of the biggest benefits when it comes to types of stone patios is that it’s going to last you a long time. To keep your flagstones lasting even longer, some suggest that you don’t seal them. Sealing flagstone can deteriorate and discolor much faster in the sun. On the topic of the sun, there are some weather drawbacks of flagstone. When the sun is beating down on it, it’s going to get pretty hot underfoot. When it rains, your flagstone will get slippery to navigate as well. That being said, flagstone performs structurally well in almost any environment. The maintenance of flagstone is rather simple as well. Generally, all you need to do regularly is to sweep away debris that would stain the stones or cause mold growth. When mold does grow, bleach can take care of it quickly and harsher chemicals can be used for rust and grease. You might also see that your flagstone needs to be adjusted if it’s set in sand. Flagstone set in concrete doesn’t have this problem. 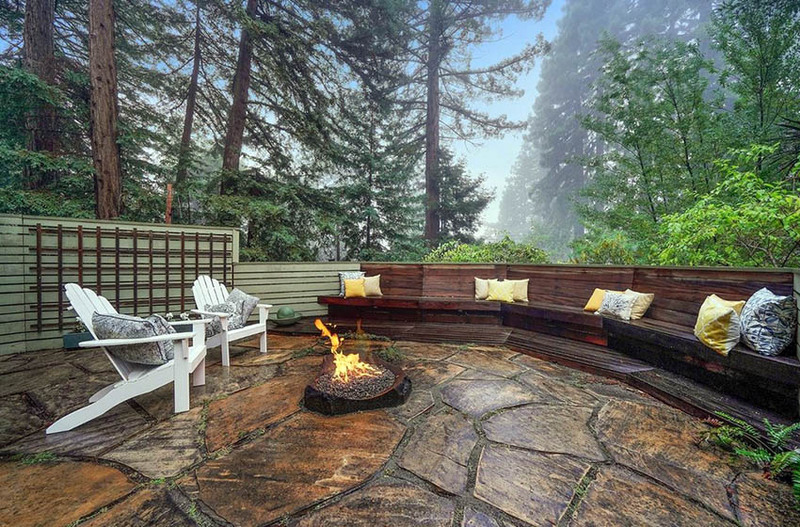 Gravel patios are one of the most inexpensive choices one can select for the backyard. 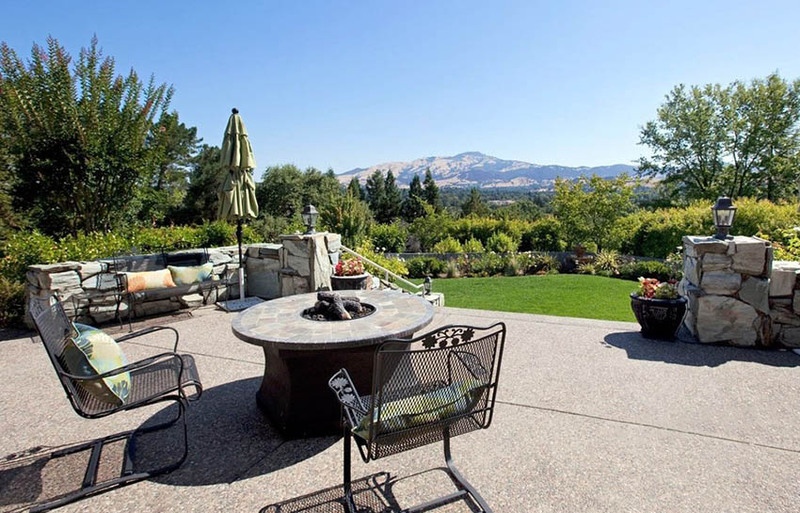 The most common material used in gravel patios is pea gravel. On average, the material for a pea gravel patio can cost as little as $2 or less per square foot. To keep your gravel patio looking its best, you’ll need to buy new gravel every 3 years for upkeep. Other gravel options that fall within this cost range include decomposed granite. Pea gravel can be made of granite, dolostone, limestone, or other rocks while decomposed granite is, of course, made of granite. These are crushed into rather small pieces. At their smallest, they can be the size of sand grains or as big as ¼-inch. The biggest problem with gravel patios is that they don’t have a uniform surface like brick or paver patios. 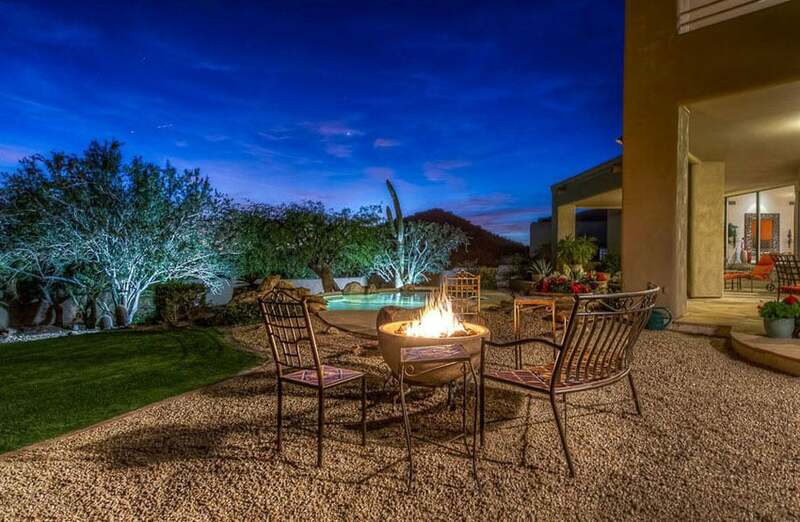 Because of this, problems such as patio furniture sinking down into the gravel is common. To help prevent this, you’ll want to use stabilizers in your patio. Whether or not you use stabilizers will affect your cost but not by much. For patios with stabilizers, you’ll be paying approximately $2 per square foot while you’ll only pay about $1.50 if you don’t use stabilizers. A great thing about gravel patios is that they won’t get slick or flooded when it rains. This is because it allows rain to travel through it and soak directly into the ground. This property also helps erosion in your backyard. In addition, this means that you don’t need to worry about installing this material on an incline like you need to with other materials like paver. One of the most appealing things about gravel patios besides the price are they can be an easy DIY project. When you are installing a gravel patio, you will want to make sure that you use a landscape barrier to separate the gravel of the patio from the dirt underneath. If this isn’t done, your patio will be less beautiful and more of a muddy mess the first time it rains after installation. You might be concerned about a snowy gravel patio. After all, how can you shovel something that is rather loose? For a light snow, you can simply use a leaf blower. This will blow the snow away without disturbing the gravel. To deal with deeper and denser snow, try shoveling as much as you can without upsetting your gravel’s placement. Then, you can use salt to melt it. Putting salt down is also a great preemptive measure if you know snow is coming. 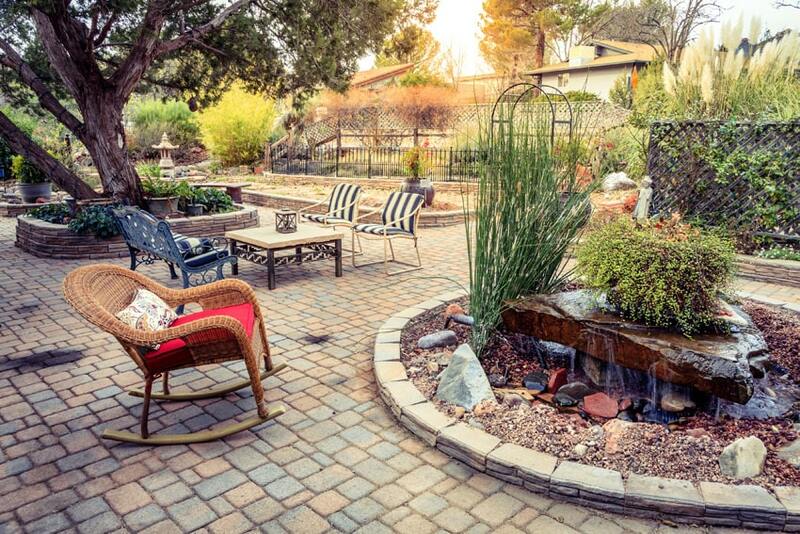 An attractive alternative to gravel is the use of river rocks to create a patio sitting area. 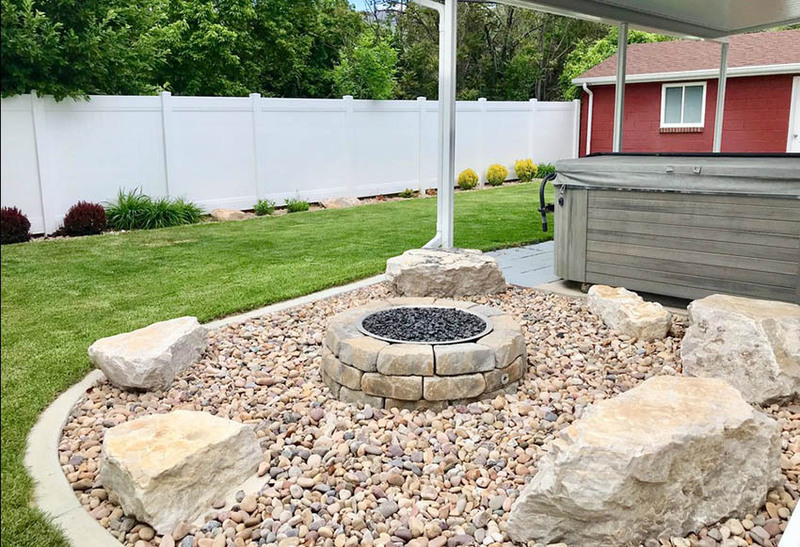 This backyard uses river rock with a circular stone fire pit and large rocks as benches to create a fun sitting area. See more gravel patio ideas here. Natural stone slate patios are beautiful and come in a variety of shades to get the look you want. There are slate varieties in shades of red, blue, black, gray and brown giving you plenty of options when it comes to color. They also come from the manufacturer as rectangular cut tiles, or as irregular shaped rough stone to help you get a perfect design. Not only do slate tiles look great as a backyard patio they are durable and made from 100% natural stone. In addition, slate tiles can be installed as a DIY project, however it can be a heavy endeavor to install. Now on the downside slate does require a bit of routine maintenance to keep it looking attractive. It can also be considered more expensive when compared to other flooring alternatives. Concrete is a versatile option for your patio because it comes in a variety of finishes and colors. As a general estimate, you can expect to pay about $6 to $12 per square foot of concrete. 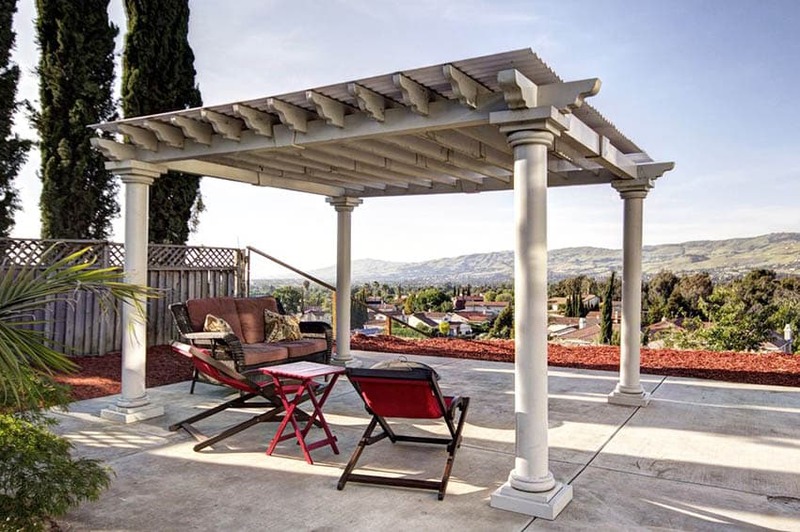 The first pro of concrete patios is that it is incredibly durable. It doesn’t shift according to climate and over time like other options and rebar can be used make concrete stronger. Unfortunately, coloring in concrete does fade in the sun if dyed. When it comes to structural breakdown, you might see that you need to repair cracks and chipping. When these structural problems arise, they can be a pain to fix especially if you’re trying to match decorative concrete. It can be costly to repair them but other than this, they are rather easy to maintain. The main thing you need to make sure to do regularly is to sweep and hose it down. There are a few safety concerns when it comes to concrete. The main one is that it is very hard and gets slippery when it’s wet. Chips and cracks make the risk of tripping worse. Because of this, some households with children go with another option. However, you can reduce how slick concrete gets by choosing a stamped design. We mentioned earlier that concrete is versatile in its design options. The most basic is polished, smooth, dye-free concrete floor. This is done with a trowel. A broom can be used to create a slightly ridged finish that will help prevent a slippery-when-wet surface. You can also choose to use edging to add beveled edges. This technique can also be used to craft joints where concrete is expected to crack. Exposed aggregate finishes are also used to help with slip resistance. This is the type of finish you see on city sidewalks and it’s done by washing away the top layer of concrete. To spruce this finish up, other materials such as limestone or rose quartz might be used. Salt finishes where rock salt is layered on top of concrete is an alternative option to provide slip resistance. Salt finish is a technique that is used to add style to regular concrete patios. To achieve this result course rock salt is added to the surface of the concrete and then washed away. Salt finish concrete is a style often used around pools. Stamped concrete uses inlaid designs to mimic other materials such as brick, slate or flagstone. It is highly desired due to its beauty, cost and low maintenance. Concrete might also be colored in a variety of ways. Pigments can be added during the mixing process and stain is applied before concrete is sealed. Sealing usually uses acid.